WASHINGTON, DC – Activists posing as biotechnology industry lobbyists and processed food industry insiders are on Capitol Hill today delivering “Monsanto’s Minions Awards” to the members of Congress who have worked the hardest to keep their constituents in the dark about the genetically modified organisms (GMOs) in America’s food supply. Following the awards deliveries to Congressional offices, the anti-GMO activists, posing as the Biotechnology Industry Awards Committee (BIAC), will attempt to shut down entrances to the Congressional office buildings to stop corporate lobbying during the shutdown. Today’s action, modeled on the one Abbie Hoffman and the Yippies did at the trading floor of the New York Stock Exchange in 1967, involves dumping out briefcases of cash on the X-ray machines at the entrances where lobbyists are waiting in line to go through the metal detectors and enter the Congressional office buildings. The corporate lobbyists are expected to lunge for the fluttering bills just as the stock traders did, creating a melee that will shut down the entrance. Lobbyists scurrying to grab dollar bills is an apt metaphor for what’s happening during the shutdown. They are here meeting with the Congresspersons they supported financially during the elections to create or protect federal laws that boost their profits. “The legislative pressure-cooker created by self-inflicted deadlines and crises like the fiscal cliff, the shutdown and the debt limit are the worst way to write legislation. Corporate lobbyists are here to take advantage of the situation. That’s how we got the Monsanto Protection Act in March. 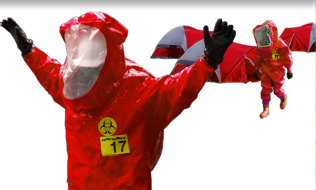 We’re here to try to stop that kind of thing from happening again,” said Alexis Baden-Mayer, political director of the Organic Consumers Association, dressed for the day as Jennetta Kontamy-Nashun, Biotechnology Industry Awards Committee lobbyist. Monsanto, the target of the anti-GMO activists’ ire, is a company that spends hundreds of thousands of dollars on campaign donations in each election cycle and millions of dollars every year lobbying. In exchange, Congress subsidizes its genetically engineered food and makes sure it isn’t labeled or safety-tested. 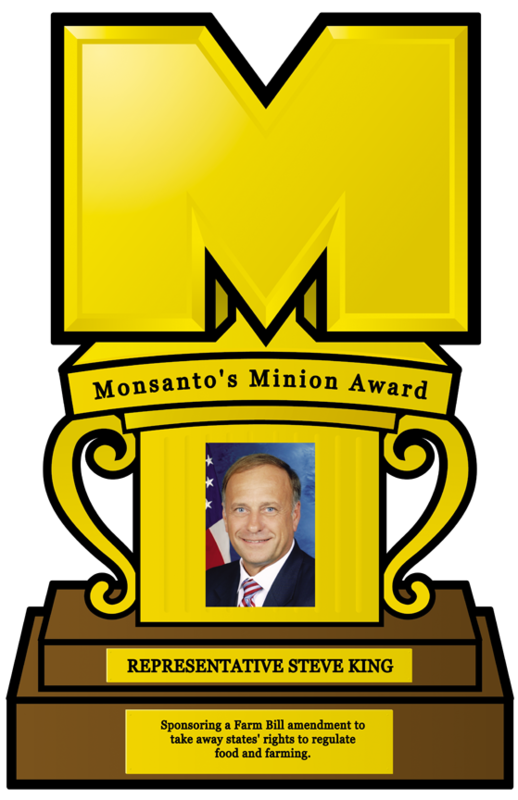 Monsanto’s minions in Congress are also available to do special favors for the company when the opportunity arises. This is what happened in March when, in order to avert a government shutdown, Sen. Barbara Mikulski (D-Md.) allowed Sen. Roy Blunt (R-Mo.) to attach a rider to the continuing resolution that took away the power of the judiciary to halt the planting of potentially dangerous new genetically engineered crops. “Now, it’s the King Amendment. If the Farm Bill gets wrapped up in a budget deal to end the shutdown and raise the debt limit, the House and Senate won’t go to through the normal conference committee process and that will make it harder to keep the King Amendment out. Everything will be dealt with through backroom deals negotiated by the parties’ leadership and the President. It’s so undemocratic! The voters get shut out, while Monsanto and the rest of the big-money agribusiness lobbyists maintain their access,” said Adam Eidinger of Occupy Monsanto, posing as Haywood U. LaBallette, BIAC lobbyist. The King Amendment to the House version of the Farm Bill was offered by Rep. Steve King (R-Iowa) in an attempt to block the implementation of a law passed by overwhelmingly by California voters that says farm animals need to be given enough space to spread their limbs and turn around. The King Amendment is so broadly written that it could take away states’ rights to regulate food and farming. The anti-GMO activists are concerned that the King Amendment, or future modifications to it, could be used to take away states’ rights to label genetically engineered food, a proposal that has the support of 93% of the public. “Congress needs to go back to business as usual and do its work of appropriations and reauthorizations through the normal process. As long as Congress continues to legislate from crisis to crisis, democracy is on hold and corporations have the upper hand. 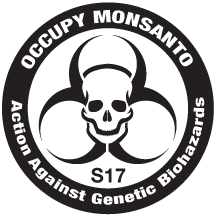 We’re anti-GMO activists, but we’re forced to be pro-democracy activists,” said Gene Crimes of Occupy Monsanto, stepping out of character, as BIAC’s Ralph Alover. The activists support Rep. David Cicilline’s (D-R.I.) proposal to ban all lobbyists from Capitol Hill during the government shutdown. They want to see Citizens United overturned and the American Anti-Corruption Act passed. They fear that if we don’t get money out of politics, we’ll never be able to pass the laws that the majority of Americans support. “The only way we can potentially win what Americans already want is by taking our cause directly to the voters at the state level, but Congress could take that away from us, too. We’re really worried that if Initiative 522 passes in Washington State, Monsanto will use one of these crises as an opportunity to slip language into some thousand-page bill to overturn it,” said Ariel Vegosen of Occupy Monsanto, taking a break from her role as BIAC’s Olive Lotta Pestasydes. Initiative 522 is a Washington State voter initiative on the ballot on November 5 that would label genetically engineered food. The biotech and processed food industries led by Monsanto and the Grocery Manufacturers Association (GMA) are spending more than $17 million to trick voters into defeating the initiative. If they don’t succeed, they’ll turn to Congress. They have many allies, including progressives like Sen. Elizabeth Warren (D-Mass.) and Sen. Mark Udall (D-Colo.) who have championed Monsanto and the GMA’s proposal for voluntary rather than mandatory labels. We were sent this Incident Report by Jeanne Blackwell from California. She loves Trader Joe’s and even wrote a letter called “I love Trader Joe’s” but like thousands of TJ’s customers, she wants proof that their products do not contain genetically engineered ingredients. I was the San Luis Obispo county volunteer signature gather coordinator here in California. Our job was to gather 527,000 statewide signatures for the California Right to Know Genetically Engineered Food Act ballot initiative. We did it and with flying colors — we collected almost a million signatures statewide. In San Luis Obispo county we collected 8,000 signatures in less than a month. Trader Joe’s was particularly ugly about allowing our signature gatherers in front of their store. They went so far as to put a sign in front whenever we were there. The employees harassed and belittled an 83-year-old volunteer by shouting in his face “You are not welcomed here.” I really tried to talk to our local managers and then I contacted the corporate office. Local managers were downright hostile and corporate never responded. I wrote a letter and sent it out to the label GMO campaign and local media. When I saw that they carry GMO products like Barbara’s Go Lean I asked them to explain. They said more than once, and as a recently as last week, “Our store brands are NOT GMOs.” I followed up by asking about their Trader Joe corn tortillas. They assured me the corn was NOT GMO. I would very much like to expose Trader Joe’s. I am pissed. The store does an extraordinary business and is built on the principle that their products are safe and non-GMO. People are trying to do the right thing and be responsible shoppers. They trust TJ’s. If TJ’s is lying there is going to be hell to pay. Perhaps Trader Joe’s is so hostile because some of the food they sell contains genetically engineered ingredients. That’s why we plan to go Shopping for Truth at Trader Joe’s during the last weekend of July.